Misfolded proteins are a disaster for the cell. They don’t do their job and become simply protein waste. Franz-Ulrich Hartl and Arthur L. Horwich have shown that the cell pays a great deal of attention to ensuring that proteins are folded into a correct and energetically efficient shape. They do so with the assistance of molecular chaperones. The chaperones ensure that the long protein chains do not become tangled up or clump together before they have achieved their correct shape. The formation of such protein aggregates is associated with many neurodegenerative diseases. 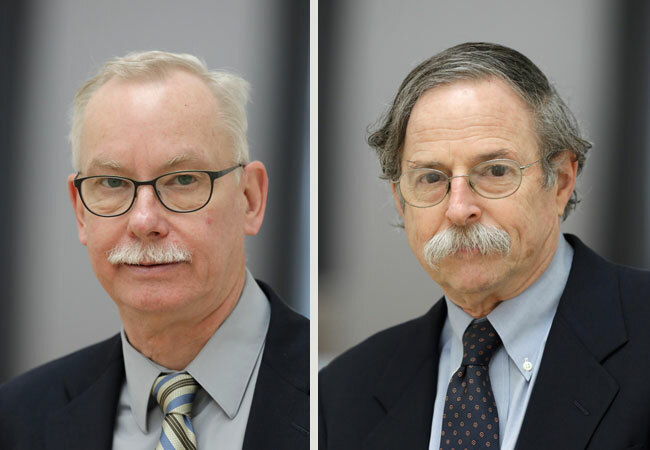 Franz-Ulrich Hartl from Germany and Arthur L. Horwich from the United States have received the 2019 Paul Ehrlich and Ludwig Darmstaedter Prize for their pioneering discoveries of a special form of cellular quality assurance, assisted protein folding. Since the cell cannot afford any errors in its protein inventory, it maintains a large range of folding helpers, or chaperones, that assist the proteins in rapidly achieving their correct three-dimensional conformations. „Without the right form, there is no proper function: this fundamental principle of technology also applies to cellular proteins,“ wrote the Scientific Council in explaining its decision. „If the three-dimensional structure is not right, the proteins will not work properly. They expose hydrophobic side chains that are normally hidden. These attract other hydrophobic side chains, become physically stuck together and contribute to protein aggregation. The cell prevents this misfolding by means of so-called chaperones or chaperonins,“ explained the Scientific Council. „Hartl and Horwich have elucidated and decoded key aspects of this machinery and have shown its importance for medical science. They have thus made an important contribution to our understanding of neurodegenerative diseases. Formation of protein aggregates is typical of Alzheimer’s dementia, Parkinson’s disease and amyotrophic lateral sclerosis,“ said Professor Thomas Boehm in discussing the achievements of the two prize-winners. Boehm is a director of the Max Planck Institute of Immunobiology and Epigenetics in Freiburg and Chairman of the Scientific Council. He presented the €120,000 prize in the Paulskirche on 14 March. The particular achievement of Hartl and Horwich is not only the discovery of chaperone functions but also the fact that they recognized and addressed the issue in the first place. In the 1980s no one was interested in protein folding because the process was considered as being largely understood since the Nobel Prize had been awarded to Christian Anfinsen in 1972. Anfinsen had shown that an unfolded protein could spontaneously refold into its correct three-dimensional shape in a test tube without any outside help. Basically this is right, but it isn’t necessarily possible in the cell. However, at the time there was no reason to believe that the cell needed any assistance in folding. The prize-winners were surprised by a mutant yeast strain that Horwich had discovered and that the two researchers were studying together. They were able to demonstrate that this mutant strain would transport proteins in an unfolded state into one of the cell’s many compartments, the mitochondria, but then failed to refold. They showed that the mutant protein is part of a folding cage, which is virtually identical in all living organisms and which requires energy to operate. This folding cage acts like a mini-test tube. The unfolded proteins, one at a time, are enclosed in the cage and are then allowed to realize their potential to fold properly on their own and without being pressured. They are not at risk of getting stuck in an energetically unfavorable and unfinished shape and ending up as protein waste. How does the folding cage recognize proteins that need support? Horwich, working together with the late structural biologist Paul Sigler, elucidated its atomic structure, showing that the inner surfaces of the cage are lined with hydrophobic side chains. These side chains reach for the hydrophobic side chains of the unfolded proteins and entice them into the cage. The cage is then capped, and the protein chain can fold undisturbed before the cap opens again. The two researchers reached this important conclusion independently by complementary approaches. In the event that the protein chain does not achieve its correct conformation in the cage, it is sequestered again through its hydrophobic side chains and is given a second chance. But the cell has additional instruments „up its sleeve“. Hartl demonstrated that another chaperone welcomes the growing protein chain at the site of its synthesis and protects it so that it doesn’t become entangled. If this is not enough to allow the protein to achieve its correct conformation, the protein chain is directed to a folding cage in the cytoplasm where it can reach its final shape without any disturbance. Today, the two prize-winners are working independently on the role of chaperones in neurodegenerative diseases: Horwich on amyotrophic lateral sclerosis, the disease of Stephen Hawkings, and Hartl on Parkinson’s disease and Huntington’s chorea. One approach that both of them have adopted is to try to increase the number of chaperones in the cell. The idea behind this approach is to counteract the build-up of aggregates typical of these diseases by ramping up the activity of the folding machinery. In other words, protect patients against the fatal symptoms of their disease by reducing the amount of protein waste. So far there are preclinical proof-of-concept studies, but no clinical results or therapies yet. Short biography of Professor Franz-Ulrich Hartl / Franz-Ulrich Hartl (62) is a physician and biochemist. He studied medicine at the University of Heidelberg and completed his Habilitation in physiological chemistry at the University of Munich. After a postdoctoral fellowship at the University of California, Los Angeles, he was appointed Professor at the Memorial Sloan-Kettering Cancer Center and the Cornell Medical College in New York, and subsequently Associate Investigator at the Howard Hughes Medical Institute. Hartl has been a Director at the Max Planck Institute of Biochemistry in Munich since 1997. He has received numerous awards, including the Albert Lasker Award for Basic Medical Research, considered a shortlist for the Nobel Prize. Short Biography of Professor Arthur L. Horwich / Arthur L. Horwich (68) studied medicine at Brown University and specialized in pediatrics at Yale School of Medicine. He then worked at the Salk Institute for Biological Studies for three years before returning to Yale University in 1981. He has been a Professor there since 1984 and is currently at the Boyer Center for Molecular Medicine and the Department of Genetics. He has been a Howard Hughes Medical Institute Investigator since 1990. Horwich has also received numerous awards. Some of these prizes, like the Albert Lasker Award for Basic Medical Research, he has shared with Hartl.